MICHIGAN -- No charges will be filed against a Detroit man whose home was overrun by 80 cats because he called for help, the Detroit Free Press reported Thursday. Harold Wyman, 66, called an animal shelter to say caring for the houseful of cats was too much for him. The shelter in turn called the Michigan Humane Society, whose members showed up at his home in hazardous-material outfits. Once inside, officials declared the house a bio-hazard as they scrambled through filth to capture the near-wild cats. "We turned a couch over, and there must've been 50 cats," said Mark Ramos, a humane society investigator, after he emerged from the one-story brick home. "It's pretty bad in there. Everything's covered. There's parts of the room where it's several inches deep." The cats were taken to the Detroit shelter for testing for diseases. Those that are healthy will be put up for adoption and the others destroyed. Nice. They rescue them from horrendous conditions only to kill them. Since he sought help with the cats, police said Wyman would not be charged with any city violation. CALIFORNIA -- A Lake Los Angeles husband and wife were sentenced Thursday to three months in jail and ordered to perform three months of community service for neglecting one of their horses. Bryanm Eichholtz, 47, and Susan Eichholtz, 46, pleaded no contest in March to a felony count of animal cruelty. They also were placed on probation for five years. The couple entered pleas during a break in their preliminary hearing after a pathologist testified that the horse probably starved to death, prosecutors said. OKLAHOMA -- Oklahoma narcotics agents and veterinarians shut down on Tuesday what they said was a major dog fighting and illegal drug network with the arrests of 14 people, an official said. More arrests are probable in the case, which involved an 18-month undercover investigation, said Mark Woodward, a spokesman for the Oklahoma Bureau of Narcotics and Dangerous Drugs Control. All of those arrested, who included a Tulsan and a Glenpool man, were being processed in Hughes County, where the major dog fighting operators operated, Woodward said. Agents from the drug bureau, the District 22 Drug Task Force in Hughes, Pontotoc and Seminole counties, and Oklahoma and Hughes counties officers were serving 22 arrest warrants, he said. Agents seized 128 dogs, most of which will have to be destroyed because they were trained to kill, he said. Eight rifles, several marijuana plants, processed marijuana, one gram of methamphetamine, $13,000 in cash, and dogfight-training videos also were seized, he said. The undercover drug bureau agents attended several fights and saw firearms, open gambling and marijuana use, Woodward said. "Much of this took place in front of small children," he said. "In addition, these agents purchased nearly 7 pounds of marijuana on six different occasions from some of the dog fighters. On one of the deliveries, the suspect brought his 2-year-old son along for the deal." Woodward described the Oklahoma operation as a major portion of a nationwide dog fighting ring. Tuesday's arrests involved only Oklahoma, he said. Five of those arrested live in Wetumka, northeast of Holdenville and southwest of Henryetta, he said. They included Camille Gann, identified by Woodward as a ringleader of the state group. At Gann's place, 32 dogs were found, along with a building where dogs apparently were trained to fight, he said. Others arrested from Wetumka were Aaron Johnson, Kenneth Roughface, Linda Johnson and Jessie Bunyard. Also arrested were Matthew Sanford of Holdenville, Mike Sanders of Gage, Steve Standifer and Ruby Standifer of Macomb, and Lee Broom, Bobby Taylor and Geri Huff, all of Spencer, an Oklahoma City suburb. 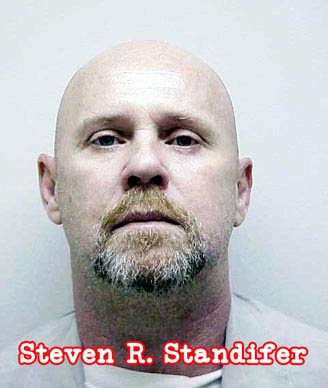 Woodward identified Steve Standifer as a referee at the dogfights. About 30 dogs were seized at his Macomb home south of Shawnee, he said. Julius Griffin, of 611 N. 28th West Place in Tulsa, and Billie Rae Noon of 14005 S. Oak Place in Glenpool, also were listed among those arrested. Some of those arrested were spectators, and they face lesser charges and punishment if convicted, Woodward said. The major operators face from one to 10 years in prison for each dog used in a dogfight, if convicted, he said. Hughes County Sheriff Houston Yeager's office processed those arrested Tuesday, but had no information. The Hughes County Court Clerk's Office said no charges had been filed by its 4:30 p.m. closing. Woodward said the investigation began 18 months ago when an informant alerted agents of marijuana sales. Agents then learned that the drug ring was tied to dog fighting, he said. Working with the state veterinarians board, undercover drug bureau agents and veterinarians infiltrated the dog fighting group, Woodward said. The agents even bought several dogs and used their contacts to get to dogfights, he said. But agents didn't put their dogs in fights, Woodward said. He described the dog fighting group as secretive and selective in setting up and inviting people to dogfights. Participants were escorted to sites, which at times were just staging areas to leave for the actual fights, he said. "It was very disturbing to view undercover video of these fights," Woodward said. "Frequently, you'd see 20 to 60 people at these fights, including entire families with small children cheering as these dogs are tearing each other apart." Woodward said veterinarians will examine the seized dogs to see if any can be saved, which he doubted. Shelters in Ada, Midwest City and Oklahoma City took custody of the dogs. "Many of these dogs had severe trauma, scarring, broken bones and other injuries from fighting. We'd love to see the healthy dogs adopted out. But, because they've been trained to fight and kill, you can never be sure they won't turn on an owner or child," Woodward said. In February, a Kellyville man and his wife received 10-year deferred sentences for a dog fighting incident on their property in November 2002. James Fiarris, 57, and Jeanne Fiarris, 56, also were fined a total of $7,500 after their guilty pleas to three felonies of instigating or encouraging a dogfight; keeping a place, equipment or facility for dog fighting, and owning, possessing, keeping or training a dog for fighting. Alphabetically, here are the 21 people charged Monday after an 17-month investigation of an alleged dog fighting ring based at Wetumka. Lee Vicker Broom, 42, Spencer: Racketeering, conspiracy, keeping a dog for fighting, instigating a dogfight, facilitating a dogfight, cruelty to animals, possession of firearms in commission of a felony, marijuana distribution, marijuana possession with intent to distribute, keeping a place or equipment for dog fighting. Jessie Martin Bunyard, 29, Wetumka: Conspiracy, instigating a dogfight, facilitating a dogfight, misdemeanor marijuana possession. Jimmy Delozier, 33, Holdenville: Conspiracy, facilitating a dogfight, cruelty to animals. Camille Gann, 52, Wetumka: Racketeering, conspiracy, keeping a dog for fighting, instigating a dogfight (two counts), facilitating a dogfight (two counts), cruelty to animals (three counts), marijuana distribution, keeping a place or equipment for dogfighting. Julius Dean Griffin, 22, Tulsa: Racketeering, conspiracy, keeping a dog for fighting, keeping a place or equipment for dog fighting, instigating a dogfight (two counts), servicing a dogfight (two counts), cruelty to animals (two counts). Geri Lynn Huff, 33, Spencer: Racketeering, conspiracy, keeping a dog for fighting, facilitating a dogfight (two counts), cruelty to animals (two counts), use of a communication device to commit a felony, marijuana distribution (three counts), marijuana possession in front of a child (two counts), contribution to deprived status of a child. Aaron Johnson, 27, Wetumka: Racketeering, conspiracy, keeping a dog for fighting, instigating a dogfight (two counts), facilitating a dogfight (two counts), cruelty to animals (two counts). Leshon Eugene Johnson, 33, Haskell: Racketeering, conspiracy, keeping a dog for fighting, instigating a dogfight, facilitating a dogfight, cruelty to animals. Linda June Johnson, 30, Wetumka: Racketeering, conspiracy, keeping a dog for fighting, instigating a dogfight (two counts), facilitating a dogfight (two counts), cruelty to animals (two counts). Jon David McDaniel, 24, Edmond: Conspiracy, possessing a dog for fighting, instigating a dogfight, facilitating a dogfight, cruelty to animals. Michael Newbold, 20, Holdenville: Spectator at a dogfight (misdemeanor). Billie Rae Noon, 18, Tulsa: Spectator at a dogfight (misdemeanor). Malik Emmanual Reyes, 25, Oklahoma City: Conspiracy, keeping a dog for fighting, instigating a dogfight, facilitating a dogfight, cruelty to animals. Kenneth Wayne Roughface, 37, Wetumka: Racketeering, conspiracy, keeping a dog for fighting, instigating a dogfight (two counts), facilitating a dogfight (two counts), cruelty to animals (two counts). Michael Kam Sanders, 31, Wetumka: Conspiracy, possessing a dog for fighting, instigating a dogfight, facilitating a dogfight, cruelty to animals. Herbert Lee Sarty, 40, Coweta: Conspiracy, possessing a dog for fighting, instigating a dogfight, facilitating a dogfight, cruelty to animals. Mark Anthony Smith, 38, Holdenville: Racketeering, conspiracy, keeping a dog for fighting, instigating a dogfight, facilitating a dogfight, cruelty to animals. Susie Ann Smith, 38, Holdenville: Spectator at a dogfight (misdemeanor). Ruby Standifer, 50, Macomb: Spectator at a dogfight (misdemeanor). Steven Ray Standifer, 44, Macomb: Racketeering, conspiracy, keeping a dog for fighting, instigating a dogfight, facilitating a dogfight, cruelty to animals, keeping a place or equipment for dogfighting. Robert Ervin Taylor, 33, Spencer: Racketeering, conspiracy, keeping a dog for fighting, instigating a dogfight (two counts), facilitating a dogfight (two counts), cruelty to animals (two counts), using a communication device to commit a felony (three counts), use of a gun in commission of a felony, gun possession after a felony conviction, marijuana distribution (three counts), possession of marijuana in front of a child (two counts), contributing to deprived status of a child.